So if you read my older post about all the caterpillars on our tree this is the update. They finished that tree and have all moved on. Last week me and Travis went to run some errands with Remy before Hudson got home from school. When we walked out there were a few catipillars leaving the tree and were on the sidewalk. Remy thought it was pretty cool and got really excited. When Hudson got home from school we showed him the caterpillars and he was brave enough to hold them. He loved it. He would get the cutest smile everytime he held them. They were the higlight of the next few days before they all left. Remy and Hudson still look for them when we go outside. Hudson showing Remy the caterpillar, he liked it until it got to close to his face. The tree, it no longer has any leaves or flowers they ate it all! It is starting to grow back a little! Hudson went to the dentist for his first time a few weeks ago. He did a really good job and was brave for the unknown. Travis had the day off so I had him take him, I myself had been to the Dentist already that week and didn't feel like going there again. Hudson did good and got nervous when they layed the chair back so he ended up laying on top of Travis and being fine. Love the face, it looks a little forced! Cute boys, Hudson has one small cavity. Travis took him last week to his appointment to get it fixed, after wating the the wating room for a good hour after checking in he went to the desk to see what was taking so long. They finally told him that they had a water main break last night and they wouldn't be able to do the appointment! Typical Puerto Rico!!! Maybe they thought it would be fixed by 1:oo, ever think about calling and canceling the appointments, or telling people when they check in!!! Duh! Okay I am done venting! We took the boys bowling on Saturday for the first time and we had so much fun! The boys loved it and it was fun to watch them take turns and cheer each other on! Hudson did a really good job throwing the ball! Hudson is getting taller and taller every day! He is getting so independent and loves to do new things. He loved bowling and thought we should take Aunt Alley and Uncle Brady when they come to see us in a few weeks! We are so excited! Remy is such a strong boy he would lift up and carry this 6 pound ball over, with our guidance so he wouldn't drop it on his toes! He would push it down this then run to the side so he could watch it roll down! He would clap the whole time until it knocked over the pins! Me and the boys! I am so grateful to be a mom to these fun active boys! I love them so much and they bring so much joy to my life! I love you boys, thanks for putting up with your Mom! Action shot, Remy helping me! Big smilies after his first time knocking down some pins! I love this picture! They are both getting so big and are becoming such good buddies! Well these next few pictures are all random but ones that I have been meaning to write about. During Hudson's first week of school I put Remy in his chair to watch a show while I had a quick shower. I came out and checked on him and he was doing good. I went into my room to get dressed fast and came back in two minutes and this is what I found! He must have been really tired, this is the first time I have ever had a child fall asleep at the table. I had to take a few pictures before I loaded him into the car to go and get Hudson from the bus stop and he slept threw it all. Remy's tongue has healed really well. I think I took this picture a week ago. You can still see his stitches in this picture; they finally dissolved all the way this week. Hudson wanted to watch Nacho Libre again for family movie night last week. So here he is being Nacho! He is wearing his Spiderman mask from his costume for this Halloween. He was reenacting all the wrestling parts it was pretty entertaining to watch him! Update on Steve-o, I think that it was really a Steve-A. Steve-O was missing in action for a few days and then one day I looked in the tree and we have over thirty new caterpillars! This picture was taken a week ago and they have all doubled in size and ate half our tree! I don't think that our tree will last another week! At least it is fun for the boys to watch them grow! For Labor day we went to the beach with about 9 families from the ward. We had a lot of fun. Our boys love the sand and water, I think they would stay and play there all day long if they had the choice. Hudson had a good time boogie boarding with all the kids, good thing he has no fear, the waves were smashing him pretty good! Travis being a "Man", he saw this log and was determined to pick it up! This picture is right before he lifted it over his head. We tried a few times to get a picture of him lifting it over his head but I had the slow camera and three tries were good enough! Remy let us bury him in the sand! He thought it was a lot of fun to try and get out. I loved how they were all looking at the picture and smiling! Cute boys, Weston ( Hudson's good buddy) Hudson and Remy! I have been meaning to post this picture and update for ever. Not much is happening at our house than the same old busy days. 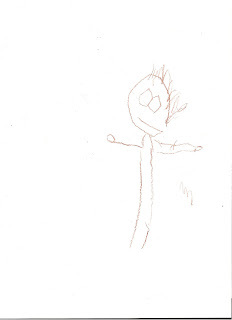 Hudson has been learning about bodies and they had each of the kids draw a self portrait. I can't believe that he drew this, he doesn’t like to color alot so I was so impressed with his picture, it made me really think about how fast he is growing up. Hudson has really liked school but he has been having a really hard time getting on the bus this week. Once he gets home he say's he had fun, so I don't now what to do. He has been saying the funniest things lately. The other day he said to me, "Mom my teacher's name is Ms. Ortiz," I responded yes it is, he then said " He is the big guy?" ( his teacher is short and a little over weight and he still gets his he and she confused). I then told him that some people are big and some our small and that we are all different sizes. He said " Like Remy is small and I am big," I could just see his wheels turning as he was thinking the then he said, " But mom, she is big like the guy on Wall-e ". Kids are to honest sometimes but I had a good laugh to myself! A few days ago he had to go to the Dermatologist to have his warts looked at, when Travis got home from work he was talking to his mom and Hudson then asked to talk to Grandma Ging, I heard him say " Grandma I have good news and bad news, the good news is that I got to play my game (I let him play his DS at the doctors only one of the few occasions) the bad news is that I had to go to the doctors". We had a good laugh, I wondered where he got that and Aunt Beth figured it out, they say something similar on Madagascar. Remy is being his normal goofy self and is always happy to give you a cheesy grin. We have been at the doctors with him every week in August; he has had non stop ear infection. We are trying a few allergy medicines hoping that it will help with the drainage so we won't have to go to an ENT. I forgot to post about me dear sweet husband, he graduated last month with his Associates!!!!! I am so proud of him, it has taken him a while but he did it. He will be starting classes for his bachelors next month! Congrats honey I love you! !